You are here: Home / Kitchen / Granite Countertops or Natural Accents that look like Granite Countertops? Granite Countertops or Natural Accents that look like Granite Countertops? Granite countertops look amazing, but they are expensive, can be unsanitary, and difficult to repair if they are chipped or cracked. What if you could refinish your existing countertops to look like natural stone? Well now you can with Miracle Method’s Natural Accents! 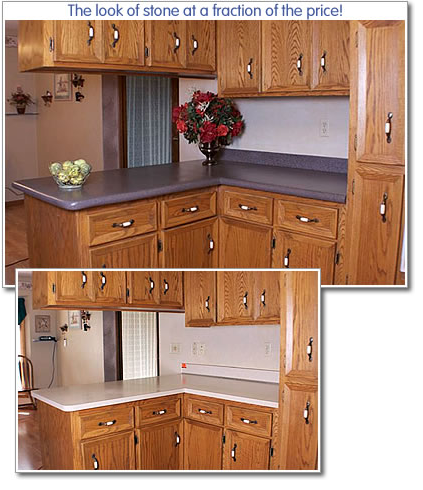 Here are side-by-side photos of a laminate countertop before and after refinishing with Natural Accents. Looks impressive, doesn’t it? Natural Accents are only offered by Miracle Method. Recently developed, these hi-tech resins can be applied to any countertop and quickly harden to provide a totally new look. Available in over 20 designer colors, Natural Accents provide the appearance of natural stone, but without the extravagant cost of granite. The durability of Natural Accents is remarkable and guaranteed against any delamination for 5 years. Granite is hard enough to cut on, but miroscopic holes and pits can also hold bacteria that can be unsanitary and even contaminate food. Granite also requires periodic sealing to prevent discoloration and staining. Worse, if a heavy pot or pan ever accidently chips your granite, it can be difficult or even impossible to repair. Natural Accents creates a new, seamless, non-porous surface for your existing countertops. While you should always use a cutting board or a hot pad to protect your counter, you will find that Natural Accents will provide years and years of service with standard care and cleaning. Should your countertop ever be damaged, it can be repaired while avoiding the significant cost of replacement. Save your money, time and construction mess by selecting our Natural Accents finishes. Remember, too, that most kitchen countertop jobs are completed in just 2 days! By the way, did we mention that Natural Accents will save you money? How much….the average kitchen countertop refinished with Natural Accents often costs $1200 or less. The average kitchen countertop installed with granite can cost anywhere between $2,500 – $5,000. Make Miracle Method your first choice for your kitchen counters. Call 855-212-7337 to get your free estimate today. Do y’all sell the product so we cab do it yourself. Thank you for your interest in Miracle Method Surface Refinishing. We only offer the service but it is extremely affordable. In fact, you can save up to 75% over the cost of replacement. Our certified and trained technicians can upgrade your bathroom or kitchen is as little as two to three days without the mess of replacement! We have 140 locations throughout the United States and Canada. You can find the contact information for the franchise nearest you on our website. Go to http://www.miraclemethod.com and click on “Find Your Nearest Miracle Method” or you can reply with your zip code and we would be happy to provide their contact information for you.